Happy Spring! Caption Contest Time! What is happening in this photo? Leave a comment with a creative caption and you could win a copy of my book How To Get Fired! Make sure to comment by 10pm on April 27, 2014. Click here to read the rules and entry requirements! I know you want to do this trust fall thing, but first, let me take a selfie. Trust me! I PROMISE I’ll catch you! Oh, wait… someone just liked my photo on Instagram! Oops! Let me show you this really funny meme about trust exercises that my friend in marketing sent me. Boy the wifi is slow…. 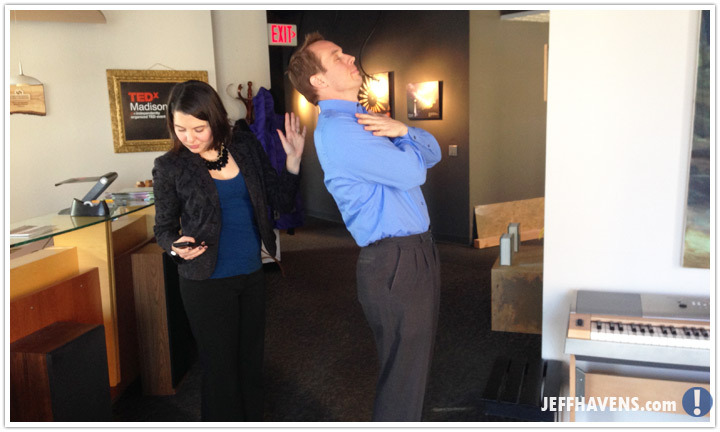 While Jeff gives the international “I’m choking” gesture, Monica watches a Youtube video called “Heimlich the cat”.